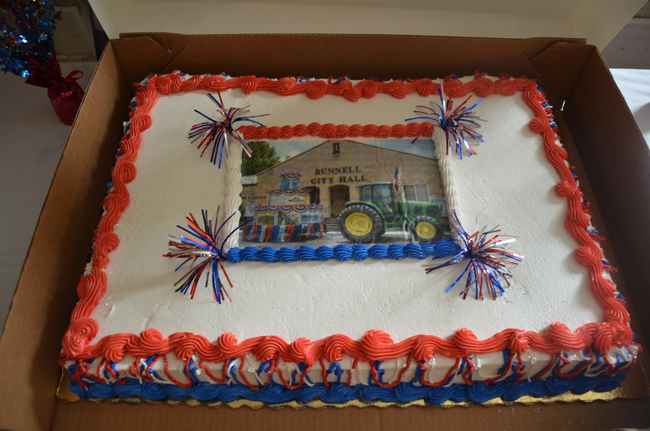 For Bunnell, it was supposed to be a year of celebrations to mark its centennial. Instead, it’s been a year of strife, embarrassment and disappointments as a realignment created seemingly irreconcilable differences on the city commission and triggered resignations and firings affecting every top post in the city–city clerk, police chief, finance director, city manager and city attorney (twice). So it’s perhaps no surprise that one of the centennial’s signature events, a $75-a-plate gala celebration scheduled for Nov. 8, has been cancelled. The city had planned on an attendance of 120. As of this week, only 17 people had paid: a city divided against itself was bound to have some difficulty drawing celebrants for such a high price, though the centennial’s less expensive events have been quite successful. “There won’t be participation to even come close to breaking even,” Lawrence Williams, the city’s new manager, told the commission Monday evening. (The catering company the city had hired for the event was to charge $32.50 per plate). The commission had a short time before voted 3-2 to approve his contract. Recommending the cancellation of the gala was one of his very first acts as manager. “It’s just a shame, it’s not fun to make recommendations like this, but it’s part of this job,” Williams said. Commissioners, in a rare moment of unanimity, were clearly disappointed, but they were not willing to accrue more losses. Bill Baxley motioned to cancel the event. Elbert Tucker seconded. John Rogers intervened. Jenny Crain-Brady lit up: “I know some good old boys who can pull off a barbecue in no time,” she said. Rogers spoke of recently cooking up 300 chicken dinners. “We do have two volunteers to work on the barbecue,” Williams joked, though he was nervous about any intention to stick to the Nov. 8 date, and there was little mention of the cost of the barbecue—to the city or to patrons who would, or might, show up. Rogers said he knew some “rednecks” who’d offer their services to the city for free, and he insisted on holding the event that night. Williams objected. Rogers persisted, and after the commission voted to cancel the gala, Rogers made a motion to replace it with a barbecue. Rogers withdrew his motion and made a motion to have the barbecue item added to the agenda. That passed. Rogers returned to the charge. Baxley wanted to back up and “get our ducks in a row before we start setting dates.” Crain-Brady suggested leaving the details of dates, cost and the rest of it in the hand of the administration, as long as a barbecue would be held. Rogers conceded. Williams meanwhile wrote and looked at his notes more often than he looked up. The evening wasn’t done for the commission. Centennial celebrations end on Nov. 11 with a scheduled Festival of the Century at 1 p.m., a centennial parade at 4, and a 7:30 p.m. grand finale. Went out and rented a tux, now I gotta get some bib overalls. Jenny Crain-Brady lit up: “I know some good old boys who can pull off a barbecue in no time,” she said. Just like the Flagler County Commission, Bunnell has lost the respect and credibility needed to function. The closed circuit circle jerk and disregard for voters wishes has become unacceptable and must be changed. The people deserve better leaders but where are they? Talk about not knowing your audience! WOW! This is a prime example of being out-of-touch and just poor decisions making. If you are going to celebrate something as a town you don’t hold a high-priced gala that will exclude a large part of your population. You hold something along the lines of a fair or festival that is inclusive of everyone.